With the American Recovery and Reinvestment Act set to spur their development and implementation, electronic health records (EHRs) are getting a lot of attention while businesses like Google and Wal-Mart have begun to develop their own EHR tools. The widespread adoption of EHRs, however, involves “huge challenges,” acknowledged Dr. David Blumenthal, the National Coordinator for Health Information Technology. To read the rest of the article at the National Cancer Institute website please go here. After Congress allocated upward of $19 billion in health information technology funding as part of the economic recovery package, the Sauk City-based Rural Wisconsin Health Cooperative of 35 free-standing hospitals said it could help its member hospitals and critical-access hospitals across the country understand how the legislation works. To read the rest of the article at modernhealthcare.com please click here. A community medical center near Philadelphia, Doylestown Hospital relies on a mobile workforce of 360 independent physicians to provide a highly responsive healing environment for thousands of patients. 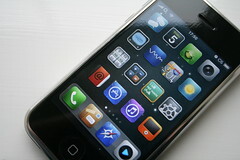 Those physicians stay connected 24/7 to colleagues and hospital staff with their first responder: Apple iPhone 3G. With iPhone, doctors get access to patients’ vital stats, medical reference applications, and breaking health alerts to provide collaborative and efficient patient care. For the complete story, including video please see the Apple site here. Talk of a nationwide electronic medical records system has centered on cost, feasibility and whether it will provide better care. But there is one potential benefit to such a system that few have talked about: the possibility of mining a massive database of patients, doctors, medical strategies, procedures and prescriptions to rein in costs based on statistics. To read the complete article at the MercuryNews.com website click here. As a former practicing physician, the husband of a physician in private practice, a former governor of Vermont, a candidate for president and a consumer, I have had the opportunity to evaluate U.S. health care delivery systems from multiple perspectives. To read the full article at Politico please click here. Nebraska Senator Ben Nelson releases outline of principles for health care reform. Walgreen Company announced that it set a record in March for the number of prescriptions it received electronically. The nations largest drugstore chain said it filled 3.1 million prescriptions electronically, a 211% increase compared with March 2008. In all, the electronic prescriptions accounted for about 15% of all prescriptions filled at Walgreens stores. The company estimates it will fill 40 million electronic prescriptions this year, compared with 15 million last year. State laws in place to protect patients’ confidentiality may be causing some hospitals to be more skittish about adopting electronic medical records systems, a factor that could impede the push for the industry to go paperless, a study says. To read the rest of the story at amednews.com website click here.